(NaturalNews) Triclosan has been a prized ingredient in Colgate toothpastes for a number of years now. While its use in antibacterial soaps has been banned by the FDA, somehow this chemical has managed to retain its approval for use in toothpaste. According to the FDA, substantial and convincing evidence of triclosan's benefits in toothpaste has been presented. Because the evidence indicates it is indeed effective against gum inflammation and plaque, it will be allowed to remain in toothpaste. 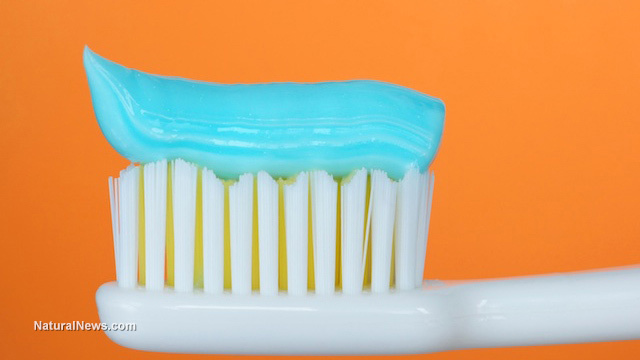 The FDA claims that it will monitor research on the safety of triclosan on a consistent basis, but so far, "medical literature does not change the risk benefit assessment for Colgate Total Toothpaste." However, over the years, research has indicated that triclosan may contribute to antibiotic resistance and hormone disruption, and it may also negatively effect immunity and contribute to cancer development. Most recently, a joint research effort led by researchers from the University of California's San Diego and Davis campuses found that the chemical agent's effects on health may be more sinister than we're being led to believe. The paper, boldly titled "The Commonly Used Antimicrobial Additive Triclosan is a Liver Tumor Promoter," was published in 2015 by the journal Proceedings of the National Academy of Sciences. NIEHS-funded scientists Robert Tukey, director of the Superfund Research Program at University of California (UC) San Diego, and Bruce Hammock, director of the UC Davis Superfund Research Program, spearheaded the study. The study leaders say that their findings contribute to previous reports of triclosan disrupting hormones and impairing muscle contractions. To conduct their study, the researchers exposed mice to triclosan for a period of six months, which equates to about 18 human years. While animal testing is not something to be condoned, the results of this study were nonetheless shocking. The researchers found that mice exposed to triclosan exhibited cell proliferation, liver fibrosis and pro-inflammatory responses – all the trappings of a perfect environment for cancer growth, according to the scientists. The team also found that triclosan had profound impacts on liver tumor growth. Mice with liver tumors that were exposed to triclosan showed a profound increase in tumor size, frequency and multiplicity when compared to unexposed mice. Kathy Keatley Garvey from UC's Entomology & Nematology News writes, "Hammock said the findings suggest that triclosan's negative effects on the liver may result from interference with the constitutive androstane receptor, which plays a role in clearing foreign chemicals from the body." Tumor growth is just one of many concerns surrounding triclosan. The chemical agent has also come under fire for other negative health effects, such as its impact on muscle function and skeletal muscle contractions. A previous study out of UC reported that triclosan exposure reduced cardiac function by up to 25 percent – the scientists noted that this effect was "really dramatic." It certainly sounds rather concerning, doesn't it? The researchers also exposed human muscle cells to an amount of the chemical equivalent to average exposure. They found that even in normal amounts, triclosan impeded muscle function, and could even cause cardiac and skeletal muscle failure. The study authors noted, "[Triclosan is] found in virtually everyone's home and is pervasive in the environment. These findings provide strong evidence that the chemical is of concern to both human and environmental health." Even Consumer Reports seems to be suspicious of triclosan's actual value to consumers. Their chief medical adviser, Dr. Marvin M. Lipman, has said that unless your dentist recommends you use triclosan-containing toothpaste, it would be best avoided. "There's enough concern now with triclosan ubiquity and safety that it makes sense to avoid it on your own, even if there is some demonstrable value at reducing plaque and gingivitis."